I thought it’s time to split out my tech ramblings in to a separate category so on the right hand menu you’ll now find tech and web drivel where I’ll hopefully post something (occasionally) meaningful and work related. I’ll also copy some older tech rants to it. iTunes told me a new version was baked and ready on Monday night, did I want to download it? Sure. Installation done, iTunes loads up and takes some time doing goodness knows what to all my mp3s but I figure I can boil the kettle and wait. I load in the new Ben Kweller album (called imaginatively “Ben Kweller”) and it sounds very nice. I click a few buttons and get to see a flipbook view of my CD covers on my screen (well, all the ones iTunes could find) and I experience a little shiver at how bizarre life is becoming while technology warps it. As I flip along through album covers I find some scary green mutations - iTunes was trying unsuccessfully to show artwork for music video clips. Erm. Ah well. My iPod (still in love with it) had to be plugged in (to receive Ben Kweller of course!) and my computer told me there was an upgrade for my iPod so I let that install. The result was a pretty diagram of space remaining on my iPod and a new way to setup which files are transferred to the iPod. Nice enough I think. It was time to sleep so I left my iTunes experimentation at that. On Tuesday at work a client was showing off her pretty little 8gb iPod Nano and there was a discussion of iTunes 7 and I found out that apparently a lot of people had been dissing it. Hmm I thought. Tuesday night I only play a few songs off an album before retiring. This morning as I wait for the lift I scroll through artists in my iPod and the letters of the alphabet appear to show me where I’ve scrolled to. Interesting, I’m sure that wasn’t there before. Nice touch.. but if that is new then what else have they done to my iPod without telling me?! Having seen Mercy Arms on jtv XL on Tuesday night I decide to listen to their demos while I walk to work, which I continue to listen to again at lunch and on my walk home. With only 6 songs this means I listen to each song two or three times during the day. Back home, I plug in my iPod, fire up Audioscrobbler, and hop over to my page at last.fm to take a peak at my page and for the most recent songs it lists 6 Mercy Arms songs, and then the last JAMC song I listened to on Tuesday night. I had listened to around 15 songs during the day. What does all this mean? iTunes isn’t reporting the Recently Played songs correctly and is only recording one instance of songs played on iPods instead of all instances. Grr. Tonight I decide to listen to random songs in iTunes and the song volumes are all over the place even though I try it with the Sound Check off and on. Rubbish I say. Though it is free. But hopefully a v7.0.1 won’t be too far away? I recently purchased the Nokia 6280 and while loyal to your brand (I’m from Finland, did you know?) I was a little surprised by some of the features. Firstly, where has Snake gone? I remember being less than happy with Snake II on my previous phone, having been in love with Snake (the original) for quite a few years, but when I figured out where the games were hidden on the 6280, there were none! No Snake, no nothing. Is this some sort of ploy between you and service providers to make me pay and download games? Not that I’ve ever spent much time playing games on my phones, but you let me get used to games, and now you took them away! I’m rather disappointed. Then, how on earth do you use this phone? There are buttons all over the place, weird folders to put all sorts of wallpapers and images and sounds and videos and what not. Thankfully you don’t have to read an instruction manual to figure out how to make a phone call, but boy does technology take leaps. I have however managed to get a picture of my choice on the .. er .. desktop (?) but can you explain why the phone has a screensaver? 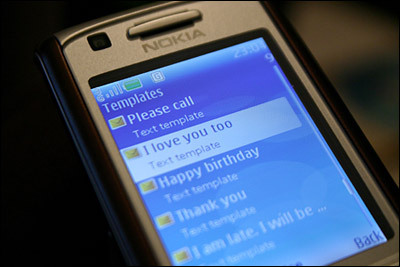 I could continue about how confused the 6280 makes me but I’ll end with this.. looking around the text messaging features I found the Templates folder and fell off my chair when I saw some of the pre-installed Templates. If someone ever sends me a text that says “I love you too” I will only assume they have lazily selected a Template rather than take the time and effort (and thought) to type it in a wee keypad themselves. Do people really need a Template for such a deep sentiment? As an organisation are you cheapening love? Love (and marriage proposals) via text is cheap and easy anyway I guess but you’re encouraging it! I do like my shiny phone. I will get used to it. But please get a grip and stop feeding the fake love! I’ve been trying to figure out how to deal with spam floods lately to this little blog of mine - gibberish comments about roulette, poker, viagra, loans and ridiculous stuff - with hundreds, and on a couple of occasions thousands, of comments piling up in the space of a day. Nothing seemed to help so I’ve taken a bit of a drastic measure (aka. editing my .htaccess file) to try and combat the problem but legitimate people who feel like posting comments shouldn’t have a problem…. but if you do, please let me know by sending me a note on my contact form. It seriously baffles me that people think it’s a great idea to write an application that, on the click of a button, hits someone’s blog over and over again to try and fill it with links to other web sites. The day when someone figures out how to spam an iPod and fill it with adverts so that you can’t listen to your own tunes until you delete thousands of spam songs will be a very sad day (I’m still loving my new iPod!). I’ve spent the past year waiting for my little iPod Shuffle to grow in to a full-bodied iPod but unfortunately it seems to have been the runt of the litter and remains at the same size. Yesterday I adopted a sibling for Shuffle, a 30GB black iPod, which kept me busy integrating it in to my life. I think I’ll call her Mary. The Jodix Free iPod Video Converter made nice neat .mp4 videos out of Jesus and Mary Chain mpgs and I spent a while staring at the little screen in awe - I still can’t get to grips with the speed of technology leaps these days, I had a JAMC video in my hand! I then transfered some photos to Mary and watched as she showed a slide-show of pretty pictures to me. A little self-flipping photo album.. am I the only one who seems stunned/confused about this? I explored the menus and found that Mary could even play games! No one ever told me this. So Solitaire isn’t much fun with the Click Wheel, and Brick and Parachute aren’t the most exciting things in the world (I’d prefer Tetris), but the Music Quiz is brilliant. The quiz plays you a short clip of a song from your playlists and shows you a selection of names - you have a limited time to match the song to the correct title. I played it for a while and wondered if there’s some quirky database that my iPod had referenced when I transferred the songs to it because most of the popular song clips would be near the chorus or other lines that would give away the title close to when the time limit ran out. There’s a lot of fun to be had with Music Quiz! Then it was time to join Last.fm and start feeding it with what I’m listening to. Easy to join, iTunes sent the right information through and my tracks started showing up. Seeing as my iPod was now feeding back to iTunes my ratings and the number of plays (which little Shuffle wasn’t able to do), I wanted to feed Last.fm from my iPod as well. I found iSproggler (who comes up with these names?) and got it installed (with a few error messages to boot but they didn’t seem to cause any problems). I had to switch off Last.fm’s iScrobbler inside iTunes and set up a “Recently Played” playlist for Mary but then it was syncing nicely to Last.fm whenever I plugged her back in and clicked the “Update iPod” button from the system tray. Then I decided that I wanted to find some audiobooks in Finnish (as you do). I found “Helsinkiin” by Juhani Aho at LibriVox - a site that offers free audiobooks. I loaded it in to Mary but she doesn’t seem to know it’s an audiobook so it just shows up under Music.. by this stage I was too tired to investigate. This morning I’ve placed a bit of code from Last.fm on to the right hand column of my homepage to show what I’m listening to. So in summary, my iPod rocks except she’s now covered in finger prints and I’m worried about scratching her screen (must go shopping and find her a nice protective coat). She’s still hungry so I need to start copying some CDs to my PC and encoding more videos. In effort not to jinx myself I’ve refrained from commenting on the new monitor and computer.. but a week’s now passed and I must say they are absolutely and utterly divine. The Dell 20.1″ monitor is crystal clear and spins around and does all sorts of tricks, while the 3GHz PC with a gig of RAM and two hard drives totalling 380GB is smoothly operating without ticks or clicks or blue screens. How brilliant to be able to hook up the VCR and generate a high quality 35 minutes video file without any complaints. Music sounds better. I don’t have to wander off to make a cup of coffee while I wait for an application to load. I can run lots of programs at once without a stutter. I’m a geek in love. Inspired by the power at my finger tips, I’ve upgraded the wordpress application running this site to v2.0.1, made a few tweaks here and there, and started hacking away at adding tags. I’ve only tagged the band photos at this stage so that by clicking on the tag you can find other photos for that band. The list of bands is on the new tags page as well as a tag cloud that displays the most common tags in larger font sizes.. woot. More hacking to be done.. Resulting in broken images! If on the other hand I put the “/” on the end of the URL (eg. http://niina.amniisia.com/) then the images appeared. replacing “yourdomain.com” with my domain obviously. Obviously I could have this completely wrong and perhaps nothing’s working for anyone anymore so if you’re seeing broken images, please let me know. * hot linking is when someone places an image on their web site that is actually stored and served from another web site. Hot linking is an annoyance because it uses up my bandwidth - if someone has permissions to use one of my images then they should save the image and uploaded it to their own web site (which is anyway what I tell those nice people who ask permission). For ten years I’d been a loyal Eudora user (that’s an email program that was a full fledged bod while Outlook was just a twinkle in Microsoft’s eye). Upgrading when they put out new releases, putting up with the regular crashes that thankfully only lost the emails a couple of times. Why did I put up with it? Sentimentality perhaps. It was from the good old days. It rarely let the virus run free due to it’s simplistic nature (I ignored the Microsoft viewer since they introduced it, gimme plain text any day). It worked but it also made me not want to email. It was clumsy for someone who gets in too much rubbish. Difficult to find what I needed to find. The other week, in one of those change-is-as-good-as-a-holiday moods (did I mention I rearranged the bedroom around the same time? ), I grabbed a copy of thunderbird and this install didn’t crash on first attempt (I tried to give it a twirl last year sometime but I guess it didn’t like Win ME). It sucked in all my Eudora emails. It searched through the years of gibberish nice and quick when I was re-organising some of my folders. It encouraged me to dump a few of my old email accounts that are full of dross. I haven’t quite got my head around it all yet. I don’t like all the separate accounts having different mail boxes but perhaps that’s just the way I set it up. The inbuilt RSS feeds seem great and I’m going to have to attack my wordpress RSS so that it behaves a little nicer. Overall it’s so much smoother than my little dinosaur Eudora. Fingers crossed it doesn’t end up chewing and spitting more than is required. After this morning’s grumble I decided to toss away blog:cms and give wordpress a go. Hasn’t been too much hassle setting up but it doesn’t work in the most intuitive way for what I was after. The RSS seems to be here but not showing correct date, full posts, or images but I don’t think that’ll be too hard to fix tomorrow. Headings and layout need some work, I’ll plug the search facility in soon, I’ve lost the comments but can hopefully drag those back somehow. Any oddities, please let me know.